A driver has been fined £940 and given 5 penalty points in a Magistrates Court for hogging the centre lane of the M62 in what is thought to be the first conviction of tis kind. According to the Huddersfield Examiner, picked up by The Daily Mirror, the driver of a Citroen Berlingo refused to move to the nearside lane, despite travelling at just 60mph and forcing other motorists to brake and causing a Mexican wave of emergency manouvres behind him. The Centre Lane Owners Group member blocked at least six other vehicles which had to brake before overtaking the MPV as it drove at a steady 60 mph in the centre lane. JPs at at Leeds Magistrates Court, heard that the Berlingo driver had several opportunities to move into the nearside lane but refused to pull over on the eastbound carriageway of the M62 near Huddersfield, West Yorks, on August 25, 2014. He failed to attend the hearing, and in his absence was given five penalty points and ordered to pay a £500 fine, plus £400 in costs and a £40 victim surcharge. This court conviction is thought to be one of the first for this offence. 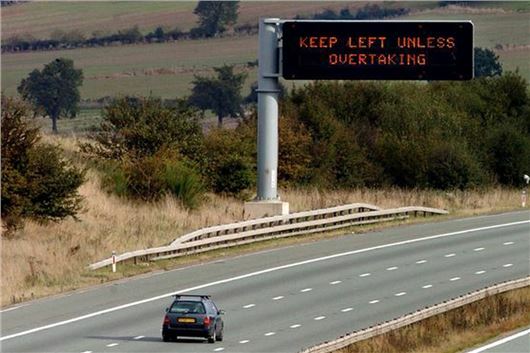 The police commented: "Lane hogging causes congestion and inconvenience to other road users. "It reduces the capacity of roads and motorways, and can lead to dangerous situations where other drivers 'tailgate' the vehicle in front to try and get the lane hogger to move over. "Members of the public regularly tell the Road Policing Unit that lane hogging and tailgating are real problems on our roads and this conviction shows that the police and the courts understand the public's concerns and take this offence seriously." New £100 on the spot fines specifically for middle lane hogging were brought in by the government in August 2013.